With a little brow know-how and the right tools from Mary Kay, your brows can perfectly frame your eyes, enhance your features and balance your face. The applicator wand of the Mary Kay® Brow Gel was designed to apply just the right amount of gel for a light hold, keeping brows in place without leaving them feeling stiff or hard. It works great with Mary Kay® Brow Definer Pencil, Mary Kay® Mineral Eye Color that doubles as a brow powder or by itself to lock in and enhance the color of your brows and keep them well groomed with a fuller appearance. It also fits perfectly in the lipstick well of the Mary Kay® Compact and Compact Pro®. 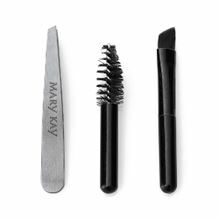 Use together with the Mary Kay® Brow Tools for a polished look. Begin by using the mini spooley brush to comb your brows into a desired shape. Use the mini tweezers to remove unwanted hairs from the brow area, being careful not to over-tweeze. Then, use the mini angle brush to apply Mary Kay® Mineral Eye Color that can double as a brow powder or use a Mary Kay® Brow Definer Pencil to add color to your brows. Use a shade close to your current hair color. Then, use the mini spooley brush to remove any excess powder and reshape the brow.